(Released) Upcoming T2 NewDark FM "A Nice Game of Chess"
Thread: (Released) Upcoming T2 NewDark FM "A Nice Game of Chess"
Greetings, tafferdom! I'm pleased to report that my T2 NewDark fan mission A Nice Game of Chess is currently in beta testing. has been released! 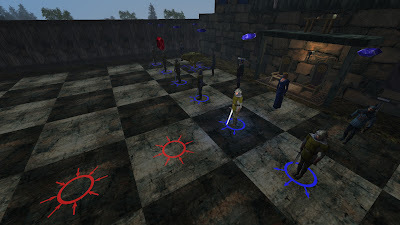 This FM is a real, playable computer chess game, set in the Thief world with appropriate AI characters as the "pieces". The Fruit 2.1 chess engine drives the computer player's moves. The City vs. Blackbrook: This is the final, decisive conflict of the two powers' long-running war, fought on a misty rural battlefield. 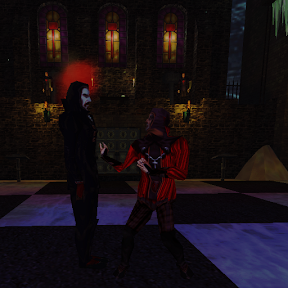 Hammerites vs. Undead: The Old Quarter is secure, but now the Order must retake another necromancy-infested temple on a snowy night. Pagans vs. Mechanists: In this alternate history, Viktoria managed to resurrect Constantine, allowing the Pagans to hold their own against the Mechanists in their rainy forest home. Blackbrook's forces are arrayed against you. Frob the gems to move the pieces. Apologies to The Sims. Baroness Felicia doesn't put up with taffers. The Immortal Game's checkmate position, Thief-style. 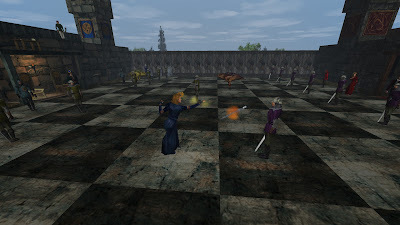 Preliminary thanks: kfgecko created a demo mission of Thief AIs making chess moves in 1999, though I have been unable to find a copy of it. 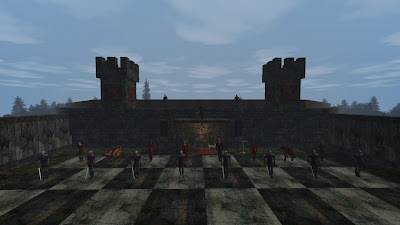 In 2003, fallen pallando, The Shroud, and others discussed possible Thief chess sets here. Both of those threads helped to inspire this FM. And, as Yandros has noted below, Archon and Battle Chess must be noted as the pioneers of this little genre. I am planning to release the FM on April 16. The mission is now released! Please see the new thread. Last edited by kdau; 16th Apr 2013 at 15:49. Reason: released! If I have taffed further it is by mantling the shoulders of giants. One thing though. The board in the pics seems large in relation to the pawns and pieces. Definitely think undead vrs hammers should be included. If you do pagans would be cool to see constantine as king and include treebeasts, crawmen, all that good stuff. Maybe Hammers vrs Woodsies. Indeed, it is. I started with more traditional proportions, but the AIs couldn't move properly during combat sequences in the small spaces. As it is, the burrick-knights still bump past the pawns as they move. I have set scale_player_speed, though, so it doesn't take too long to tour the battlefield. Thanks! I'll send you a Visitor Message shortly. I agree that King Constantine (and Queen Viktoria, of course) would be essential, so I suppose it would have to be Hammers instead of Mechanists fighting the Pagans to avoid anachronism. Hmm. Translators: I would like to include a full set of languages in my final release. The amount of text is relatively small, but I would prefer translators who have some familiarity with chess, as technical terms need to be translated appropriately. Again, please reply here or email me if you have that background and can help. I have an offer for French, but still need other languages. Ahh, I see. Well I can always set up a traditional board along side to study the position. This looks amazing! Kudos on executing the idea. The Fruit 2.1 chess engine drives the computer player's moves. I'm really curious how you managed to utilize an external chess engine from within a fan mission. Thanks, I'll send some requests as soon as I can PM. Oh, I see what you mean. Well in that case I might be able to create a traditional proxy board on the "player's table" (which has the "log of battle" [scoresheet] book, time control clock on Expert, etc. ), as long as beta testing doesn't reveal a swarm of bugs to keep me busy fixing. Thanks! One of my custom scripts spawns the engine as a subprocess from BeginScript and attaches to its stdin/stdout pipes (UCI protocol). Every move made in-game is sent down to the engine, and a periodic script timer checks the pipe for replies. I think something like this was mentioned in the FM "Acid Trip"... where you can try to play chess with the "things" you find in the mission.. (the hammers with squid heads)..
thing was, you could only do that if you made a perfect "corpse fall".. which I was never able to do for some reason... couldnt get the timing right. as for this... I"m looking forward to it... very orginal. I'm wondering, do we actually need a certain knowledge of chess to be able to play this properly? Are there any tutorial sessions included? I must confess that Acid Trip freaked me out so much the first time that I never finished it. 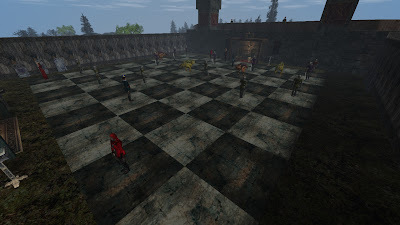 So I jumped to the area you're talking about in DromEd, and while it isn't actually a functional chess game, the sight of the Hammerthulu facing you across the chess table is...intimidating, to say the least. There will be three difficulty levels, so on the lowest the computer opponent won't be too challenging. You'll need to know the basics, but the game will only allow you to make legal moves, and your pieces have decals under them showing what directions they can move in (see top right screenshot). As for a tutorial, it's probably too much extra effort to include a full sequence. Now that you mention it, though, I might throw in the Wikibooks introduction to chess as a readable on the table. That's really impressive how you talk to the engine process. I didn't realize the hooks were in Dark to do that. So, is it a given that you played Archon and Battle Chess back in the day? Ah, thanks, I knew there had to be chess-with-combat computer games out there. But no, I'm too young to have played either of those, I'm afraid. *researches* Wow, lots of accidental similarities. Battle Chess even had spellcaster queens. It doesn't look like theirs shot magic scepters from their tiaras that flinderized into gold coins, so I think I'm still reasonably original. I've just issued the second beta version of A Nice Game of Chess, fixing issues and adding features. But I still only have two beta testers. If you have the time and would enjoy making AIs attack each other, why not volunteer? No prior chess experience is necessary. Please reply here or PM me if you're interested. Last edited by kdau; 15th Mar 2013 at 23:14. Lol, if we had T2MP working for ND, this would be a perfect FM to retool for MP. Indeed. 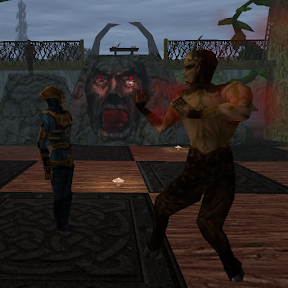 If ND:MP does ever happen, I'd be glad to put out a multiplayer version. From a brief look at the INetworkingScriptService, it shouldn't be a huge change to my code. kdau, your voiceover samples have been uploaded and I sent you an email. I don't have tons of time, but I could still do some beta testing, if you'd like. i read now your post and i accept to translate your mission. I will send you an email. Thank you, they're great! I replied with details by email. Thanks! You should receive all the information by email shortly.